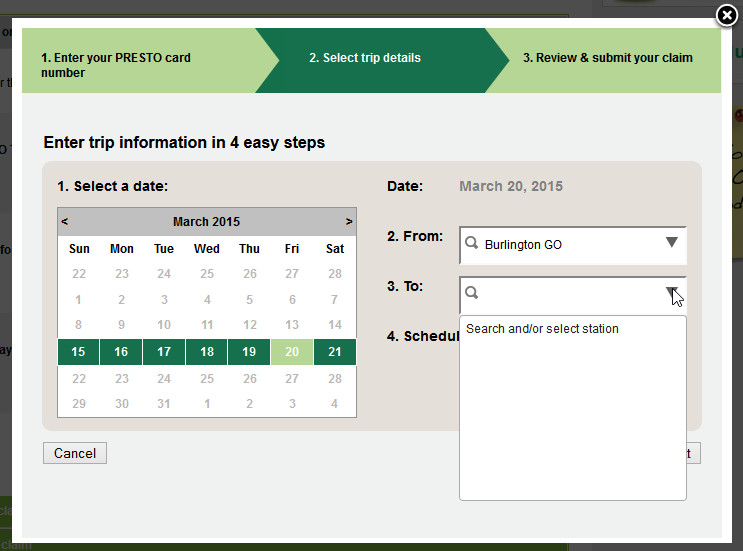 When GO Transit operates an impromptu train such as Friday's trip E921 announced by Burlington station staff as all stops to Oshawa, and the trip is fraught with delays to Union station, whereupon passengers are told to leave the train and catch a later one for points east of Union, why is that trip not covered by the GO Train Service Guarantee? That is DISGUSTING that you started this trip at 5 pm and didn't make it to your destination until almost 7:30. And people wonder why I drive to my job in Oakville from Scarbourough (x3 days). I used to GO train it but stopped after the crap last winter and I noticed it didn't improve this winter! Even with traffic, it never takes me 2.5 hours one way. The service guarantee website is not functioning correctly. I've tried to determine if my train ride from last week qualifies and I can't select the station where I got off. Guess no one can claim anything... poor service. Shouldn't you remove the Presto Card number to protect the privacy of the writer? Any GO CSR is free to look this person up seeing as this was a legitimate complaint.